Is This How Robert De Niro Fell in With the Anti-Vaccine Crowd? Robert De Niro appeared on The Today Show Wednesday to make it crystal clear that he personally supported the inclusion of anti-vaccination film Vaxxed in the Tribeca Film Festival. A Facebook photo posted yesterday shows that he also met recently with a group of people well-known in anti-vaccination circles, including Jim Carrey and Robert F. Kennedy Jr. The photo was posted by Eric Gladen, the filmmaker behind Trace Amounts, an anti-vaccination documentary that premiered last year. Gladen’s picture shows De Niro and his wife Grace standing with Jim Carrey, Robert F. Kennedy Jr. (who is, yes, one of Those Kennedys and who thinks vaccines cause autism). Also present were Gladen himself and John Raatz, a PR and marketing guy from a small New Agey-sounding firm called The Visioneering Group. Seeing De Niro with Gladen gives us some insight into what he may believe these days. Trace Amounts claims, basically, that there’s mercury in vaccines and it’s making your kids sick. That is not true. At one point, years ago, there was thimerosal in some vaccines, a form of ethylmercury used as a preservative. Out of an abundance of caution, it was removed in 2001, But ethylmercury is much less toxic than methylmercury (which should be avoided even in small doses). The World Health Organization says the doses of thimerosal once found in vaccines are safe, and studies have found no causal relationship between thimerosal exposure and any negative effects on an infant’s neurological or physcal development. 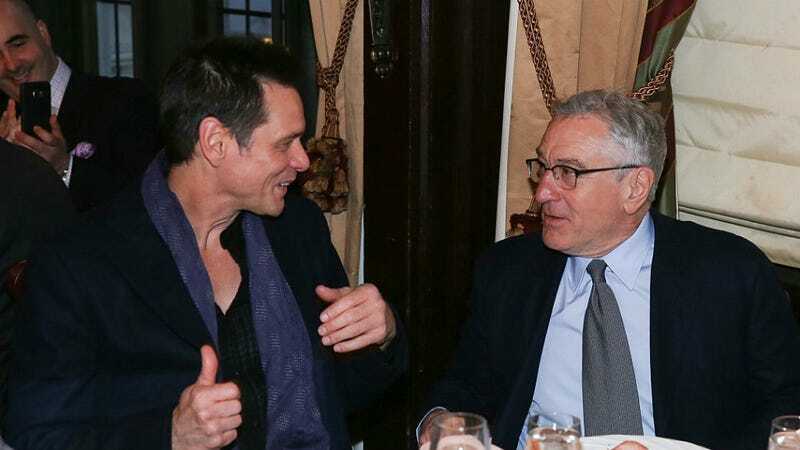 All that suggests that De Niro and Carrey are perhaps gearing up to become the new celebrity faces of debunked, nonsense claims about vaccine safety. It’s terrifically depressing, but also really, really interesting: how in the hell did De Niro fall in with these folks? After all, Jim Carrey’s connection is clear: it’s Jenny McCarthy’s fault. But De Niro’s son Elliot, who has autism, is 18 years old; De Niro didn’t have much to say about vaccine safety during the height of Jenny McCarthy’s anti-vaccination fame, around 2009. That suggests that De Niro got involved in this murky world sometime in the last five or six years. But how? We may have an answer: A tipster suggested to Jezebel that De Niro met Andrew Wakefield, the former doctor who authored the now retracted and debunked “vaccines cause autism” study, in 2010. That’s when De Niro was in Austin filming Machete, in which he played a racist Senator. Wakefield lives in Austin with his wife and children now, having left his native England amid a cloud of controversy. Machete was written and directed by filmmaker Robert Rodriguez. He and his then-wife Elizabeth Avellan wrote a glowing blurb for one of Wakefield’s books, Callous Disregard. Respectful Insolence, a very good science blog, also explores the Rodriguez- De Niro connection as a possible way that De Niro found his way into the anti-vaccination world. And The Texas Observer reported in 2013 that Rodriguez and Avellan also raised money for the Thoughtful House Center for Children, which Wakefield founded in 2004 as an autism research center. He resigned in 2010; Thoughtful House has since changed its name and appears to have cut all ties with Wakefield. It really seems as though we’re gearing up to face another publicity blitz from the anti-vaccine lobby. The last, McCarthy-led round contributed to declining vaccine rates in some wealthy pockets of Southern California. What fresh public health disaster does this one have in store?